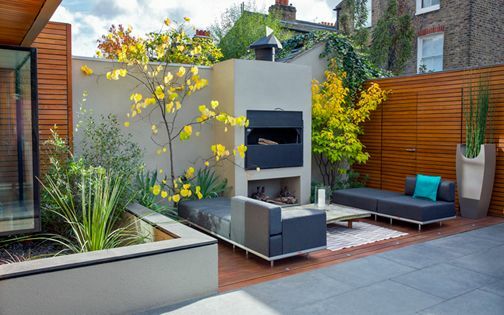 This three-storey Parsons Green family home features four outdoor spaces across 54 square metres, including front and back gardens, a small rooftop and an upper roof terrace – with picturesque views of South Park. 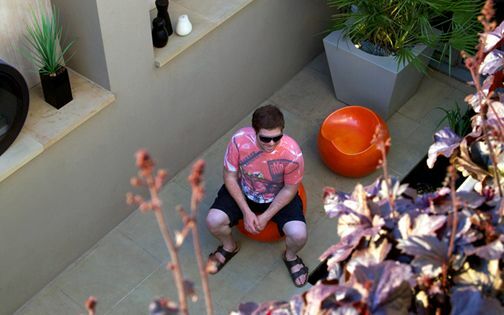 The family who took the challenge of transforming this terraced house from a bland framework into an exciting personalised prospect handed us the task of redefining their gardens' context, and designing a sequence of manageable exterior spaces. 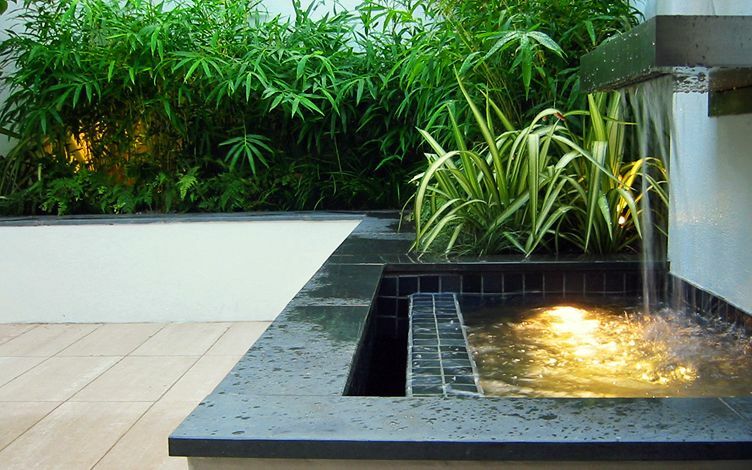 With an aquatic theme permeating the project's core concept, amid a highly bespoke garden design landscaping to complement our clients' penchant for architectural detail, we created a refined progression of gardens and rooftops – within a warm south-westerly aspect and copious shelter. 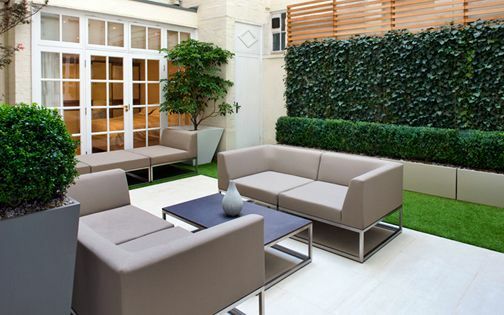 Our clients' extensive remodelling of their Parsons Green family home created a unique, multilayered blueprint, enhanced by three outdoor spaces at the back of the residence. 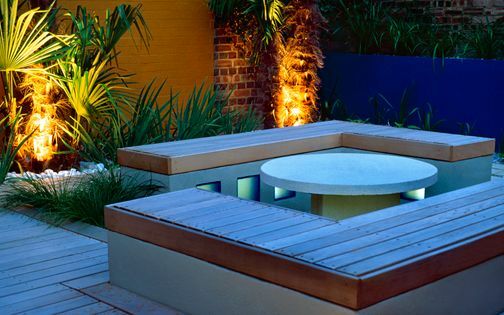 A multifaceted garden design augments this exterior sequence with a well-balanced layout, encompassing a modern courtyard patio and two upper roof terraces. 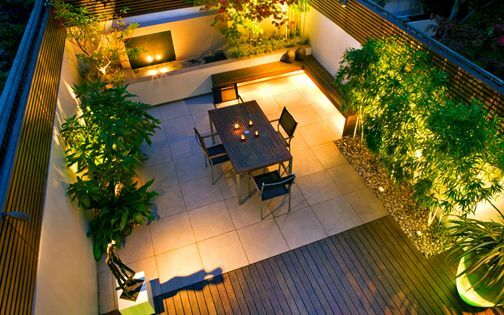 Each linked space defines a distinctive ambience, where South Park's elevation narrates an array of vistas, from eye-level views in a small second floor balcony to verdant treetop panoramas across the master bedroom's 22-square-metre rooftop terrace a floor above. 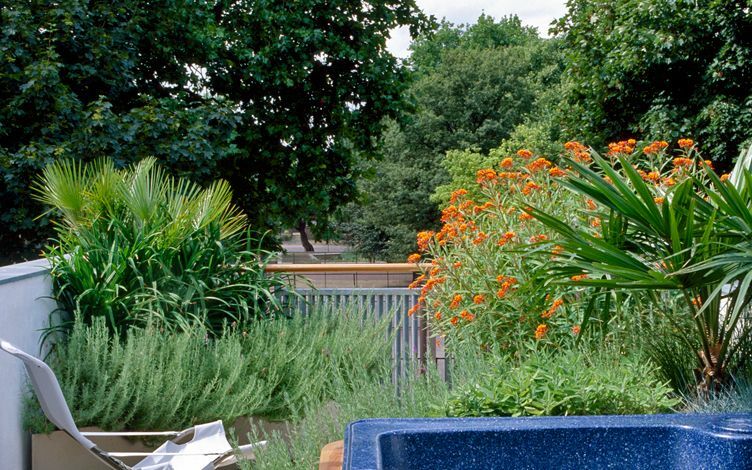 To increase seclusion throughout the gardens, we developed a refined succession of outdoor privacy screens, in varying materials, to enable a cosy environment within a high-density South London urban setting. 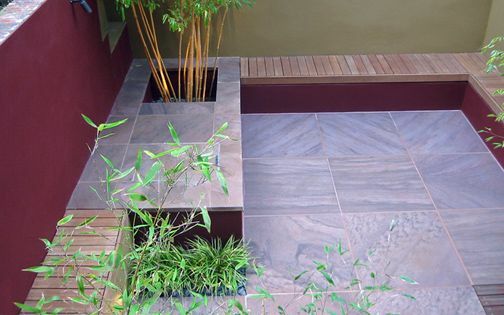 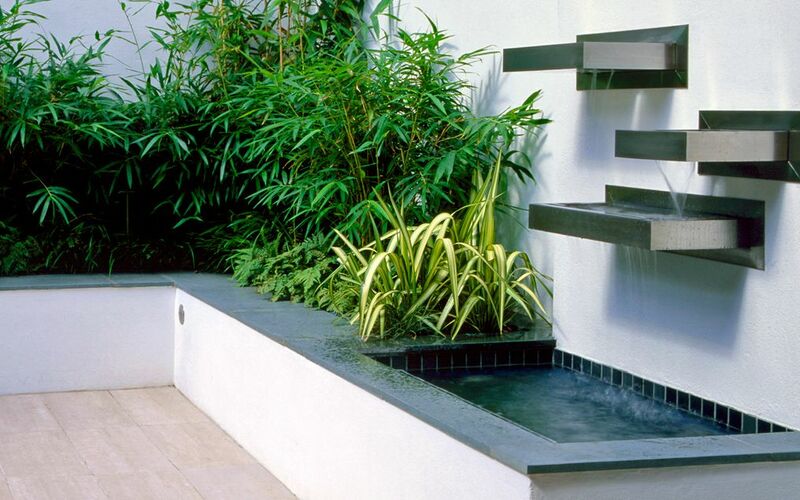 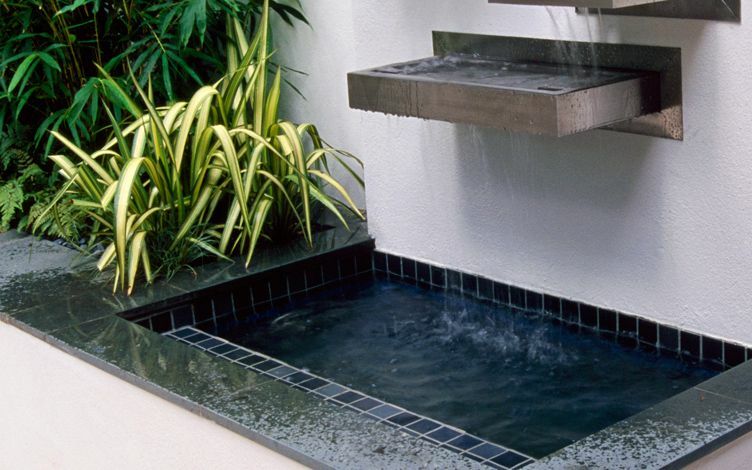 With a vertical built-in aquarium enveloping the kitchen, and our clients' frequent travels to family in California and love of water elements, we designed a cascading waterfall across the patio's right elevation to balance an asymmetrical raised bed which vitalises a square garden outline. 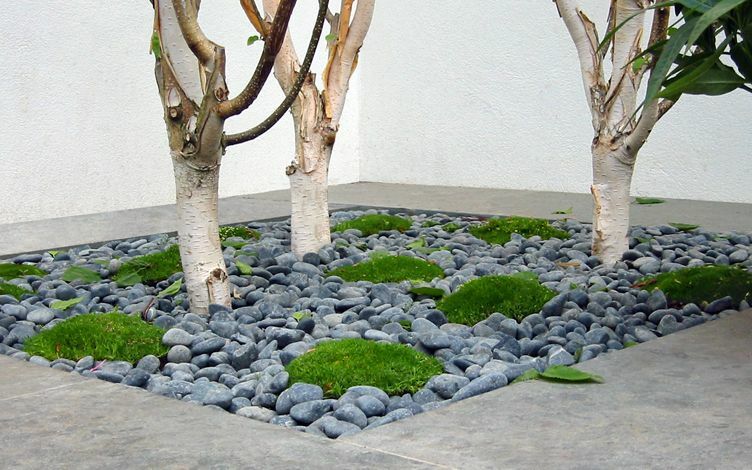 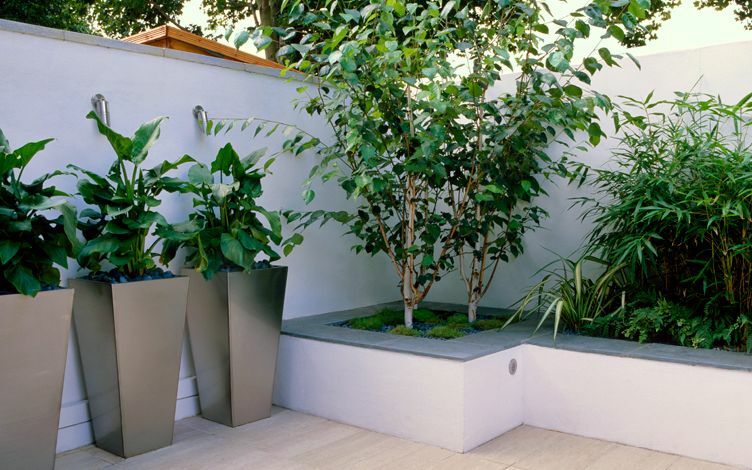 While this walled modern courtyard patio lies predominantly in shade, the water feature's stainless steel detailing and glazed blue tiles bounce off daylight and invigorate their setting under park tree canopies, coupled with an overall light-toned garden colour palette, consisting of porcelain tiles, off-white render and pale slate coping. 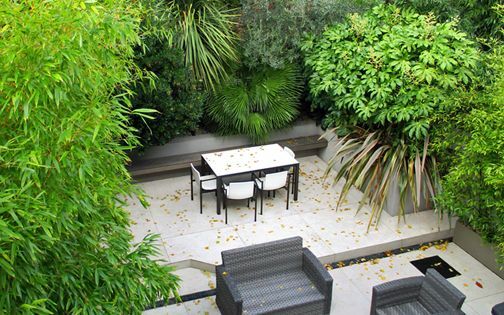 The multidimensional interplay of Arum lilies, Himalayan silver birches, New Zealand flax, Japanese Bamboo, Ferns, Moss and Sedges articulates a spectrum of woodland and stream edge greens, yellows and whites – defining clarity and straightforward maintenance within a shaded small courtyard garden design in South West London. 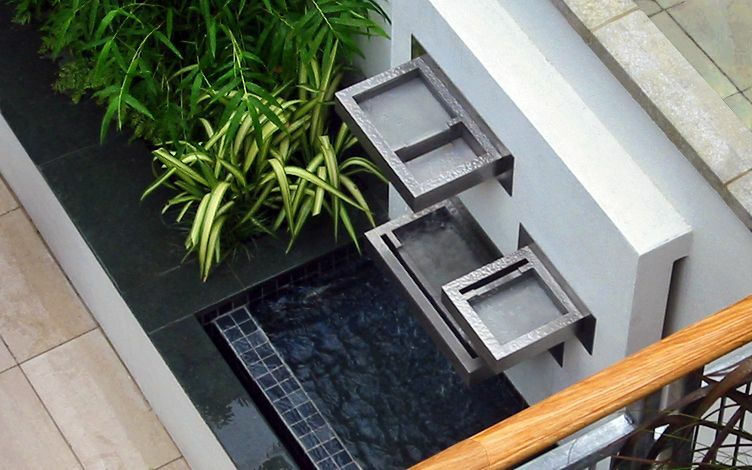 A picturesque vista from an upper balcony is absorbed along a well-fitted symmetrical roof terrace design, defined by L-shaped bespoke planters. 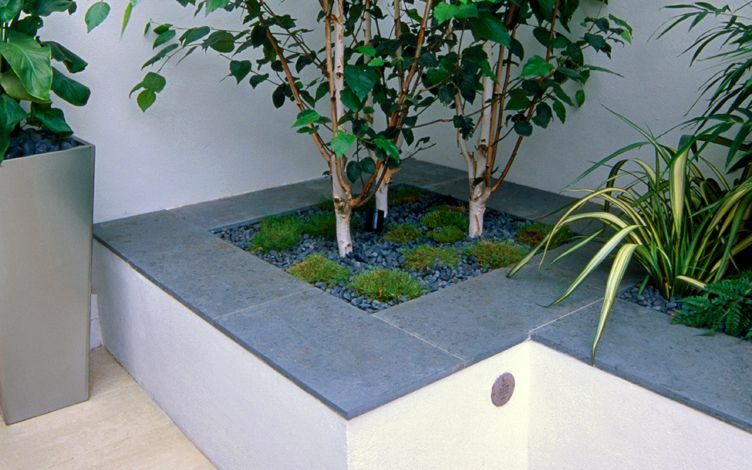 This intimate 8-square metre niche was carved out beside a guests' bedroom to benefit from South Park's expansive London plane tree matrix. 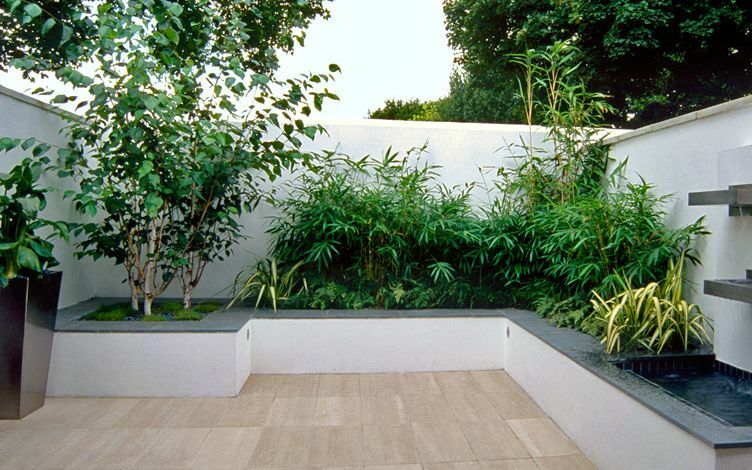 The courtyard's rectangular beige tiles were incorporated into both roof terraces, and produce a seamless surface continuum, expanding sense of depth towards its verdant backdrop. 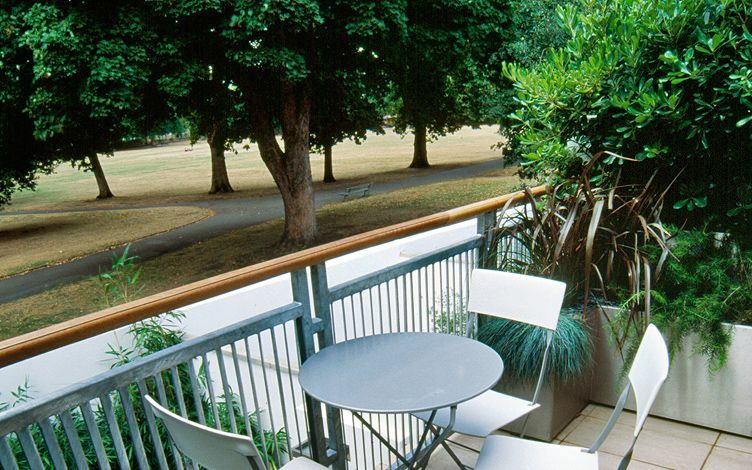 To enhance privacy among the public park and adjacent properties, we designed vertical louvre panels, composed of angled galvanised steel balusters, capped with smooth European oak handrails – generating a unique detail design, robust frameworks and much-needed seclusion. 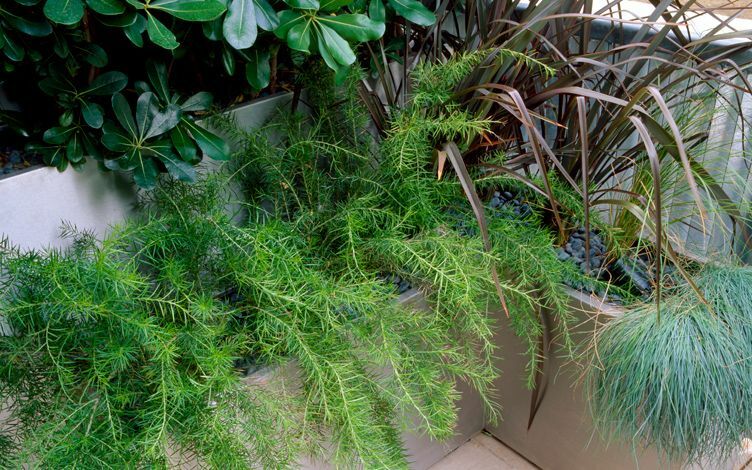 Here, where the sun-filled balcony faces south-west, amid an unrestricted perimeter, its flora encompasses Grevillea, Blue fescue grasses and scented Mock orange shrubs, forming a high contrast of colours and textures above reflecting surfaces and stainless steel troughs. 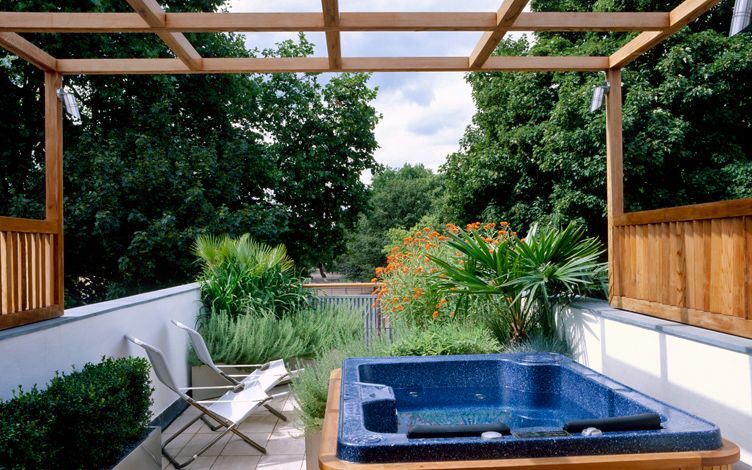 A well-used roof terrace adjoins the home's master bedroom at the top floor, and while tucked away intimately, this private sanctuary soaks up sun, views and a snug hot tub. 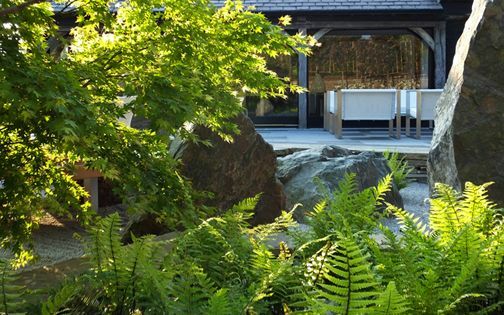 We designed and built an integrated Western red cedar arbour and screen above the concrete and slate parapet walls to seclude this spa area, alongside vertical adjustable louvres – skilfully handcrafted and dowelled by our team. 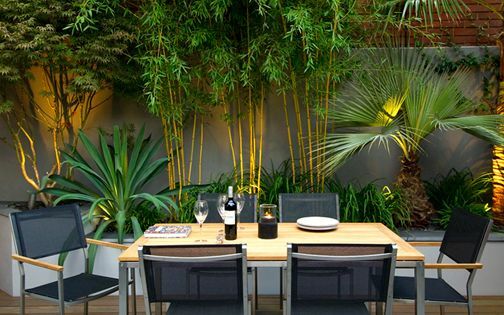 The terrace's warm microclimate, sheltered among mature parkland tree canopies, sustains a highly textural, tactile and scented planting scheme which juxtaposes semi-hardy species effectively, while fusing a myriad of courtyard design ideas to amplify a small garden space. 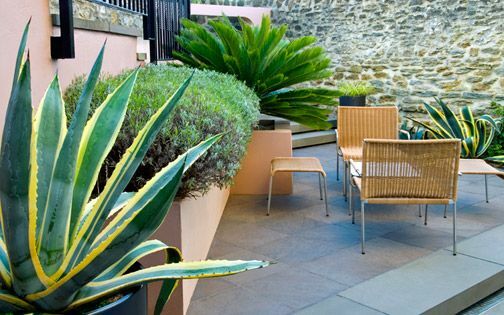 Asclepias curassavica, the Bloodflower, yellow Daylilies, purple French lavender, Livistona australis, the Cabbage-tree palm, Sage and white Marguerites provide an evergreen Mediterranean rooftop ambience – reminiscent of our clients' Californian residence. 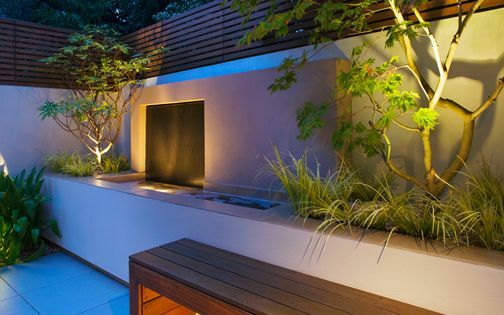 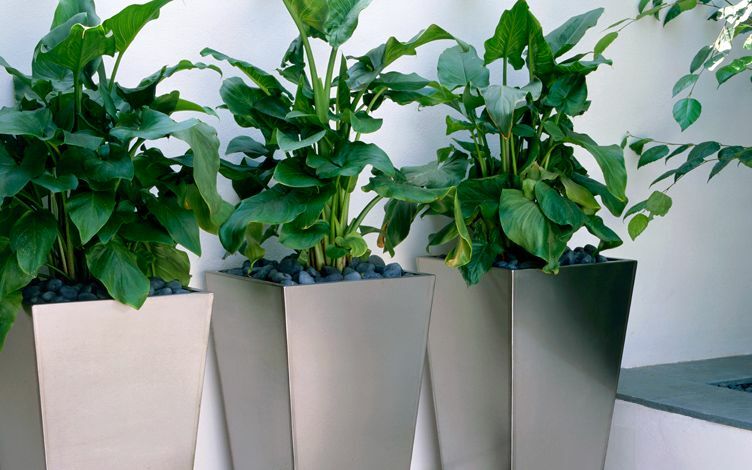 Stainless steel light fittings maintain a streamlined lighting design approach, well-suited to cedar wood, while echoing the courtyard's tall vases, water feature, terrace handrails and the rooftops' triangular plant containers. 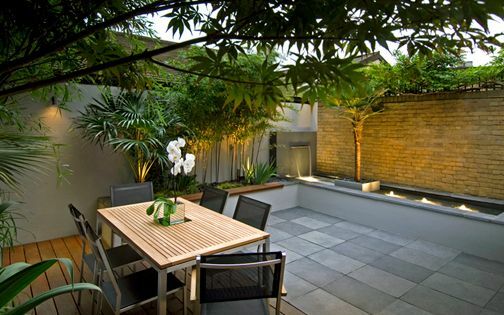 These small individual spaces contribute en masse to a well-defined series of liveable gardens, each ideal for its purpose, where cohesive patio ideas at the project's outset, meticulous architectural detailing and supportive clients within a multidisciplinary garden design practice produced a memorable courtyard environment.